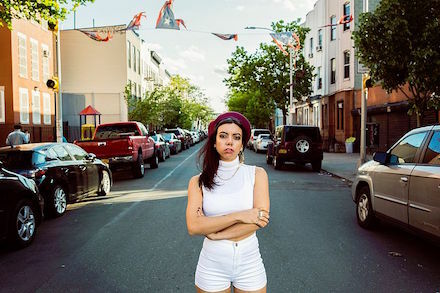 Hurray for the Riff Raff is a folk-blues and Americana band from New Orleans, Louisiana. "Rican Beach" is the first track off of Hurray for the Riff Raff's 2017 album, Navigator. Alynda Lee Segarra, the band's lead singer, dedicated the song to protestors at Standing Rock, and in Peñuelas, Puerto Rico, where coal waste has contaminated the drinking supply. In an interview with NPR, Segarra said the following of the song: "'Rican Beach' is a fictional place and the song is a cautionary tale. It tells the story of a city progressing rapidly into militarized and segregated areas. There's a lot of symbolism in the song that reflects our times, of course. I felt the water protectors at Standing Rock and the people of Peñuelas were important to reflect on while listening to the lyrics. The point of view is one of resistance, people of color claiming their space and their right to exist. It is about claiming ancestry and recognizing a history of facing systemic oppression while protecting and connecting with the land. Even though it was written about an urban space, I think it speaks to the actions of these activists who are connected with the earth."